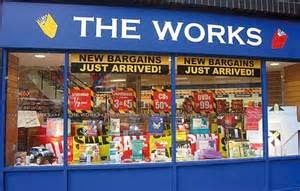 It is a weekly ritual for us to visit The Works bookshop every Saturday morning to see if they have any cut price cookery books that we haven't already bought. This bookshop seems to have an ever increasing number of cut price books by all the famous TV chefs and many more by lesser known, but nevertheless, accomplished cooks. We wanted a book recently on preparing and cooking game birds and The Works did not let us down with a stunning publication - 'The Game Cookbook' by Clarissa Dickinson Wright. At £6.99 and reduced from £25.00 it was a real bargain. 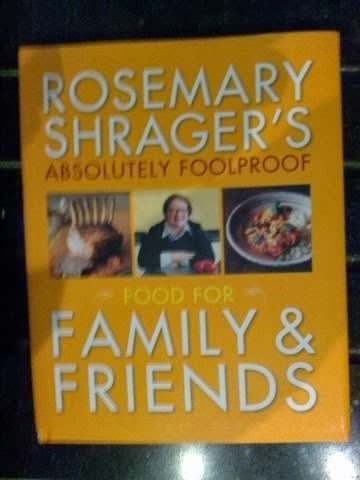 The week before we had bought Rosemary Shrager's 'Absolutely Foolproof Food For Family & Friends', another cracking book with fabulous photographs, techniques and recipes (right). This book is ideal for a beginner, taking the reader through 20 essential recipes with techniques in fantastic photographic detail, and dozens of variations and ideas for more recipes, plus hints, tips and plenty of explanation to take the mystery out of cooking. The quality and clarity of the photographs in a cookery book are critical for me, as good photos can inspire you to cook the recipes. 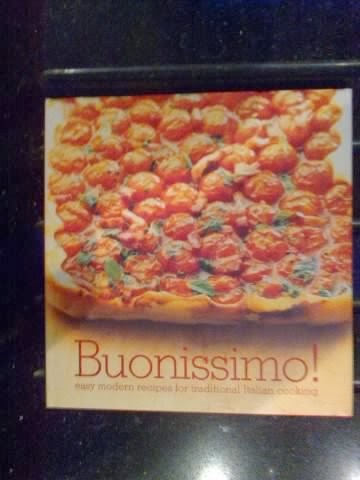 The photographs in Nigella Lawson's recent book, 'Nigellissima', available at The Works at £10.00, instead of £26.00, are very poor and don't inspire me to cook her dishes. 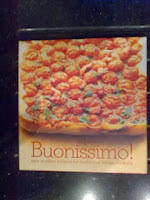 Many books on Italian cookery have far more exciting pictures. For example, 'Buonissimo by Silvana Franco and others (below left), and 'Fresh Italian' by Marina Filippelli. Both have beautifully photographed and inspiring dishes with simply explained recipes. There are so many cookery books on the market currently that one has to be highly selective if you are to make regular and beneficial use of the dishes featured. My blog on 3 December 2013, entitled 'Greedy Chefs' quoted Michel Roux Senior's view of the current brand of 'get rich' TV chefs, quick to make a fast buck from a TV show followed by a book, without having established their cooking credentials. The Works is full of books by these TV chefs like Tom Kerridge, a recent TV 'discovery'. 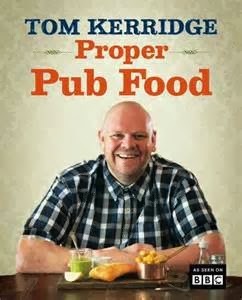 Sadly, the idea of 'getting rich quick' may be short lived for Tom, as his TV book 'Proper Pub Food' is now only £6.99 (RRP: £20.00 below). It is the same for most other big name publications, priced at 60% below the cover price at The Works. Inspiring and creative cookery books are not difficult to find, if you are prepared to wade through and discard the smiling faces of Nigella, Jamie and Gino D'Acampo and not be distracted by strap lines like ''a new BBC series'' or ''as seen on TV''. Look for the names of well established chefs and cooks who have worked on their recipes over time, who have not used ghost writers for their books, and who appear to have had creative control over the book's pictures and descriptions. How can you tell? Firstly read the inside cover or back of the book that gives you some overall description of the content of the book and the author. Look for dual names on the cover. 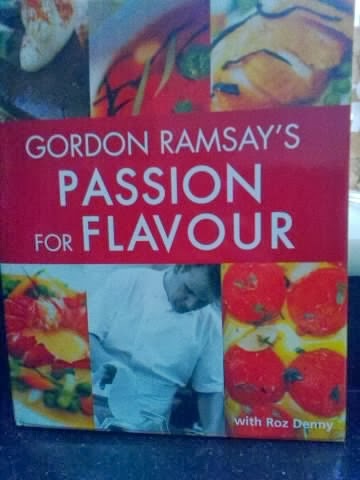 We have a book entitled 'Gordon Ramsay's Passion For Flavour' with Roz Denny (right). This book is not written by Ramsay but a freelance cookery writer. It is easy to be deceived. The acknowledgements page can be very revealing as to whether the chef on the front actually wrote the book or whether there was a ghost writer. It all also indicates what control the author had over the contents and the photography Look for good quality photographs that make your mouth water by simply looking at them. Ensure the recipes are clearly laid out step by step, with ingredients that are easy to acquire. These days few chefs make their own stock, but some books on French cuisine, expect you to spend ages making a stock. 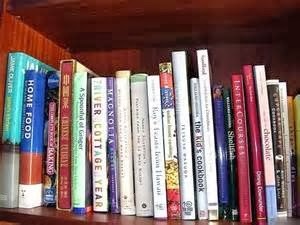 Look for books that also offer alternative ingredients if the items recommended are not available or out of season. Good luck in finding some inspiring cookery books.